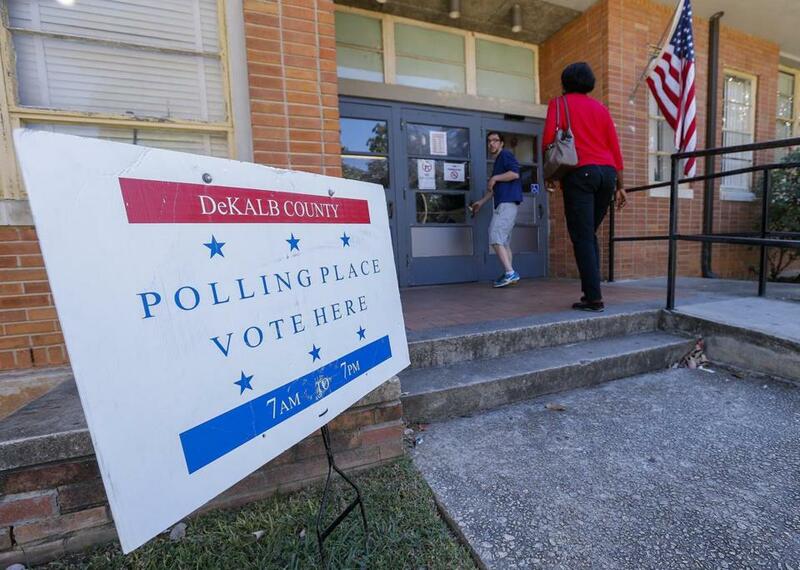 People cast their ballots on the first day of early voting in Georgia. On Sunday afternoon, as the political press debated whether Donald Trump was attacking voters’ confidence in an election he continued to call ‘‘rigged,’’ a denizen of ‘‘Weird Twitter’’ named @randygdub made the online equivalent of an eye-roll. It was not the most credible of pranks. For one, @randygdub’s Twitter profile had him living in California, not Ohio. (“California is a diversion,’’ he explained/joked in DM today.) For another, the ‘‘ripping up ballots’’ line was perfectly in sync with a persona that mocked Trump supporters for believing any rumor that flew in from the Internet. But as The Daily Beast’s Betsy Woodruff was first to recount, the ‘‘ripping up ballots’’ tweet rocketed through the bloodstream of conservative media. On Monday morning, blogger Jim Hoft, whose Gateway Pundit website regularly wins links from the Drudge Report, ran with the @randygdub tweet with no apparent attempt to check its facts. ‘‘An Ohio(?) man who describes himself as a postal worker bragged online this weekend about destroying Donald Trump absentee ballots,’’ Hoft wrote. And @randygdub triumphantly retweeted it. Within an hour, Hoft’s story was featured at the top of the Drudge Report - and @randygdub retweeted it. To anyone who wanted to spend a few seconds clicking through, a major conservative news source had just pranked itself. But a few hours later, Rush Limbaugh shared the ‘‘postal worker’’ story with his millions of listeners, accusing the media (apart from Drudge) of ignoring a damning story of political corruption. While Limbaugh was speaking, the information account of the U.S. Postal Service answered a worried question about the ‘‘postal worker’’ tweet. By late Monday afternoon, The Daily Beast and plenty of other outlets had written up the tweet for what it was — a joke at the expense of people worried about election fraud. That did not stop Jon Husted, Ohio’s secretary of state, from telling his followers that he, too, would look into the grave matter of @randygdub’s tweet.